Do you remember the last time when you had the interior of your car thoroughly cleaned? If you don’t, it must have been a long time ago. Although many people use their cars every day to go to work, go on a vacation in the countryside or make a memorable road trip, those who regularly clean the upholstery are few. 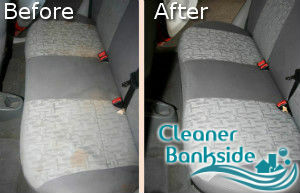 Now, our company offers professional car upholstery cleaning services in Bankside. You don’t have to visit us, our cleaners will be on your driveway at a day and time that is convenient to you. First of all, the price of our services is absolutely reasonable. Our Bankside, SE1 – based customers appreciate the high quality we deliver without charging them a small fortune. Second, you don’t have to dedicate more than 10 minutes of your time to the car upholstery cleaning. You just have to give the car keys to our cleaners, so they can do their job and get your keys back at the end. The car upholstery cleaning service we deliver is performed by steam cleaning machines. They extract all dirt and dust, eliminate bad smells and successfully remove stains. Our cleaners will also vacuum the interior of your car and no chemicals or toxic substances will be used. When they finish with the cleaning the upholstery they will also use a high quality air freshener that removes bad odours. We guarantee that the service will be delivered by experienced car upholstery cleaning experts. They have an eye for detail and no dirty spot will be missed. The interior of your car will look and smell really fresh. Ensure your comfort by booking with us now. We are available in SE1 every day, including holidays. 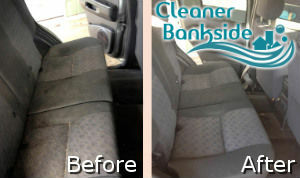 Having a clean car upholstery has never been easier. Hire us and leave the dirty job to our professionals. Don’t hesitate to give us a call and ask our operators for a free quote. The exceptional quality of the service is guaranteed.